Wiker and Greenblatt agree in their historical narrative of the modern world as a product of the turn away from The Christian cosmology of intelligent design to the Lucretian cosmology of evolutionary atomism. Greenblatt celebrates this historical turn as moral progress, while Wiker laments it as moral degeneration. I will be posting some very revealing quotations. "Abortion. Euthanasia. Infanticide. Sexual promiscuity. Ideas and actions once unthinkable have become commonplace. We seem to live in a different moral universe than we occupied just a few decades ago. Christian moral tenets are now easily dismissed and have been replaced with what is curiously presented as a superior, more magnanimous, respectful and even humble morality. How did we end up so far away from where we began? Can the decline be stopped? Ben Wiker, in this provocative and insightful book, traces the amazing story that explains our present cultural situation. Wiker finds the roots of our moral slide reaching all the way back to the ethical theory and atheistic cosmology of the ancient Greek philosopher Epicurus." For some reason this picture doesn't show up in the first post - here it is. I will await further info from Daniel before getting a copy of this book. Here, I think this FAR overstates the case as to Darwin being a "disciple" of Epicurus. Darwin is "the most potent formulation of that philosophy [Epicurus] to date?" That is way overstated! Do we actually know that Darwin was either an explicit fan of, or quoted, Epicurus? We do know that Nietzsche was at least in certain respects a fan of Epicurus, but that Nietzsche was not a fan of Darwin. I have not read deeply into Darwin but my gut tells me that Nietzsche is right on this, and that Darwin probably does not deserve a lot of study by an Epicurean except to note Darwin's development of theories of nature that are not guided by supernatural beings, which is only one aspect of Epicurus. If anyone has comment on this please include it either here or in this separate thread on Darwin. I will post further Darwin-specific comments in this separate thread on Darwin. 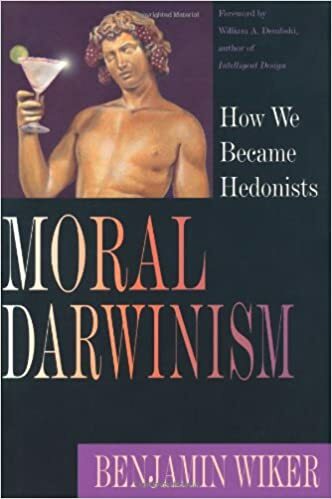 And maybe this book on Moral Darwinism contains the link between Darwin and Epicurus. Lucretius could not have been a Darwinian for obvious reasons. He did posit natural selection, but not via Darwinian adaptation and evolution. Hiram you are much better read in Darwin than am I. Did Darwin ever even cite Epicurus or Lucretius approvingly in his main works for any aspect of his ethics or epistemology (or his physics)? Did Darwin even have an ethics that he promoted as proper, or is all the "Darwinian morality" stuff that people added on as their take on the logical implications. But right at the start, if you indicate that he was clearly Christian and therefore believed in supernatural gods, then that's a huge point of division. Cassius, please do not get a copy of this book. It comes from a very Christian conservative perspective, very unsympathetic towards Epicureanism. It's just that I enjoy following J. S. Mill’s advice ("He who knows only his own side of the case knows little of that..."). When I research a topic I like reading the best arguments from the other side. Wiker claims that all contemporary moral debates are simply the result of the clash of the Christian moral universe with the Epicurean moral universe. Regarding Darwin, Wiker doesn't claim that he was a follower of Epicurus, just that Darwinism is a modern type of Epicureanism, as opposed to Aristotelian Scholasticism, Cartesian Rationalism or German Idealism. The genealogy would be: Lucretius-Gassendi-Anglo Empiricist school of Bacon, Hobbes, Newton, Locke...till Darwin. I will be posting all the interesting bits. Christians must see the world as intelligently designed by the divine Creator, who exercises providential care over human beings and who judges them in the afterlife as deserving heavenly rewards or hellish punishments for eternity. Christians can interpret many of the ancient philosophers - Platonists, Aristotelians, and Stoics - as teaching that the world is fundamentally mindful and purposive and thus supporting a Christian cosmology. But they can't do this with the atomistic cosmology of Epicurus and Lucretius, which must be seen as the fundamental rival to Christianity. Moreover, Wiker argues, one must defend Christian cosmology if one wants to defend Christian morality. As a comprehensive account of the universe, every cosmology implies a morality, because every account of nature as a whole implies an account of human nature - the moral and intellectual life of human beings - as part of cosmic nature. Daniel how did you come across this book? Is it well known? Darwin was a naturalist, not a philosopher. He did not elaborate ethical repercussions of his finding, as a scientist. He stayed within his realm, and only posthumous interpretations of his SCIENCE by philosophers have been done (sometimes leading to error, as in the case of Nietzsche's mis-understanding of evolution and adaptation via natural selection as if it led to a "superior" or "higher" man or form of life necessarily). Darwinian "morality" (whatever that means) is an invention of post-Darwin intellectuals. But note that in nature we see competition, but also cooperation, and that all life exists within **systems** that involve mutual benefit and symbiosis (mutual inter-dependence at many scales), so that so-called "social Darwinism" is a HUGE politically-inspired error. If there is anything that deserves to be called "social Darwinism", it's networks of mutual aid and mutual benefit. Darwin does not cite Epicurus or Lucretius, as far as I know. He did follow the Lucretian method of FIRST observing nature, then reasoning explanations for what he sees, only based on what has been observed. As far as I know, the book is not well known. I had downloaded it - together with other titles, such as "Elemental Epicureanism" - on my kindle, a couple of months ago. I must have found the title intriguing, maybe because it comes from a perspective which is not mine at all. I had started to read but found it boring. Anyway, a few days ago I saw that Hiram made a reference to the book on FB, and that encouraged me to pick it up again. Edited once, last by Daniel ( Apr 2nd 2019 ). "Why has contemporary science choose to ignore or dismiss the existence of a designing intelligence? Why has it sided with the materialist?..." "...As I shall argue, modern science itself was designed to exclude a designer. Even more surprising, modern science was designed by an ancient Greek: Epicurus..."
"...The argument of this book is that the ancient materialist Epicurus provided an approach to the study of nature - a paradigm, as the historian of science Thomas Kuhn called it - which purposely and systematically excluded the divine from nature, not only in regard to the creation and design of nature, but also in regard to divine control of, and intervention in, nature..."
"...This secularization culminated in Darwinism because it was with Darwin that materialism, which had been slowly but surely permeating and re-forming the predecessor Christian culture, finally reached and devoured God the creator and the immortal human soul, leaving behind a completely Godless, soulless universe..."
"...Every distinct view of the universe, every theory of nature, necessarily entails a view of morality; every distinct view of morality, every theory about human nature, necessarily entails a cosmology to support it..."
"...The so-called culture wars are the result of this great conflict...Epicurean materialism and Christianity have been implacable foes since the very origin of Christianity...there is no possibility for compromise in the current moral debates between the rival sides..."
I agree that Wiker came up with an interesting title in "Moral Darwinism" -- a title that probably lends the book more gravity than it deserves. "...The entire materialist account of human nature, society, morality and religion, which forms the stream of modernity flowing toward its culmination in Darwin, is found clearly and succinctly stated in Lucretius. Lucretius seems so modern because we are so Lucretian..."
(1) Random variation at the atomic level brings about a diversity of creatures at the level of species. "...Whether we are Christian or not, it is simply true from the very beginning Christianity set itself completely against Epicureanism at all points. The victory of Christianity in the first five hundred years A.D. necessitated the defeat of Epicurean materialism.The two could not coexist..."
"...Nor could they coexist when Epicureanism was revised in the Renaissance...This, the antagonism between moral Darwinism and Christianity in the 19th century and beyond was and is simply a continuation of a very ancient animosity..."
All of those a week reasonable and correct to me. The only small quibble would be that I think we always have to be careful with the word "random" not to imply that anything is possible. I don't think "anything is possible" is Epicurean, and would cite the AA Long article "Chance and Natural Law in Epicureanism"